Lisa was born in Nottingham. She spent most of her childhood drawing, daydreaming and making up stories in her head (but never getting round to writing them down). As a teenager she was bitten by the acting bug and, at 19, moved to London to study drama at university. Following graduation, Lisa adopted the stage name of Lisa Cassidy and spent several happy and chaotic years occasionally getting paid to pretend to be other people. Between acting roles she worked as an office temp and started making up stories all over again, only this time she had a go at writing them down. One of them eventually became The Art of Being Normal. 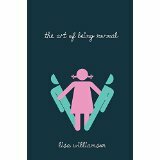 Lisa now lives in North London, where she is lucky enough to split her time between writing and acting. In her spare time she reads a lot of books, continues to daydream and eats way too much sugar. Find Lisa on Twitter @lisa_letters and on her website.